We're on YouTube! Subscribe now to our channel. Here's an exciting alternative to the usual company outings! Within only three years, what used to be a rice field became a burgeoning forest. 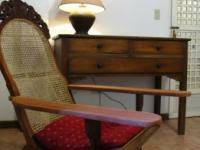 We offer cool and comfortable rooms, cottages and family suites at the Forest Club. Sixty employees of Prime Water Infrastructure Corporationspent an entire day of team building activities in Forest Club last 16 August 2008. PWIC is the exclusive water system management company of Camella Homes, Crown Asia and Brittany Homes. At present, it serves a total of 250 subdivisions with about 51,000 households. To view more photos of the activity, kindly visit our multiply site. Went to Laguna for our first PGC team building (last 25 July 2008). Had a really great time. Here I figured out that I really have a bad sense of balance. First we had the crossing the swamp, walking and holding to ropes. Did it well. 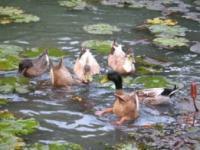 We have just deployed six native ducks, locally known as "itik", into our organic rice field to help us get rid of Golden Kuhol (Golden Apple Snails) that are a menace to our organic rice crops. Golden Kuhol bring down rice yields in the Philippines by as much as 40%, and Filipino farmers have been resorting to massive use of synthetic molluscicides that are expensive and broad spectrum, affecting non-target organisms including human beings. We have opened up two rooms at the once private main house to guests, and we are calling the rooms Apitong and Bagtikan. We name all our rooms after the trees that can be found in Philippine rain forests, to help educate our guests about our rich natural heritage. Abigail Yabot organized a unique birthday party for her son Tristan's 13th birthday last June 2, 2008 at the Forest Club. Here is her e-mailed account and pictues of the event. Tristan enters teenhood in The Forest Club Tristan, 2nd of 4 siblings, celebrates his 13th birthday through a teen camp with his friends at The Forest Club. We, the Junior Financial Executives organization of St. Scholastica's College Manila, would like to extend our deepest thanks for welcoming us last May 26, 2008 for our teambuilding activity. The place was awesome, the activities were great, and the foods we ate are delicious. We would like to share some of our pics: rhea's site and loren's site. Go! Go! Go! ... Gang Green! Forest Club has hosted three team building sessions this summer for faculty and staff of Dela Salle University Dasmarinas. Last 28 March, the student council of the College of Engineering held a two day team building seminar. The faculty and staff of the Liberal Arts College, Department of Behavioral Sciences in turn had their team building workshops on two installments: the first on April 3 to 4 and the other one last May 6 to 7, 2008. All three groups made use of Forest Club's in-house team building program, the Eco Adventure Program. For the seventh straight year, Forest Club was once again home to Camp COPE (Children Overcoming Diabetes Problems Everywhere) last 1 to 4 May 2008. About 40 insulin-dependent children and young adults joined close to 30 doctors, nurses, counselors and volunteers in this year’s camp. Every summer, Camp COPE in Forest Club comes alive to adventurous campers with insulin dependent diabetes. Amidst the lush backdrop of trees, a rolling blanket of healthy green grass, and an inviting lagoon, children look forward to this camp. Even doctors are prescribed to take a break. And that's just what 35 doctors from St. Luke's Medical Hospital did last 27-28 April 2008 at the Forest Club. The doctors chose the special Adventure Race Module of The Forest Club's Eco Adventure Program for their team building activity. 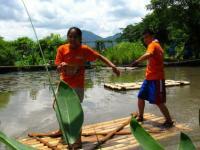 In the Adventure Race teams are given tasks that they have to complete one at a time. Most of the tasks were physical in nature though a few also required careful planning and a bit of strategizing.